Einar was strolling with brisk confidence along the Bergen harbourside, casting a critical eye over the comings and goings of the various watercraft. Though at ease in the blue sky and sunshine, even from a distance you could tell in his poise and steel gaze that he was a man equally comfortable in less clement weathers. He had the implacable aura of a man who had threaded spinning seas choked with jigsaws of ice, tackled waves vast as paradigms as they turned fully on their heads to render gravity moot… and paused now on a sunny afternoon only briefly to reflect, before plunging again into another churning labyrinth of storm-worshipping water. Meanwhile, searching for shade on the north side of the harbour, I had a background waiting a stranger in the lea of the vast Ocean Response vessel. The broad curve of the prow and slick marine paint were nicely distorting a reflection of the distant old town. Einar was happy to pause for a moment, chatting affably about Bergen and equipping us with information that would provide the anchor for our weekend’s exploration thereafter. 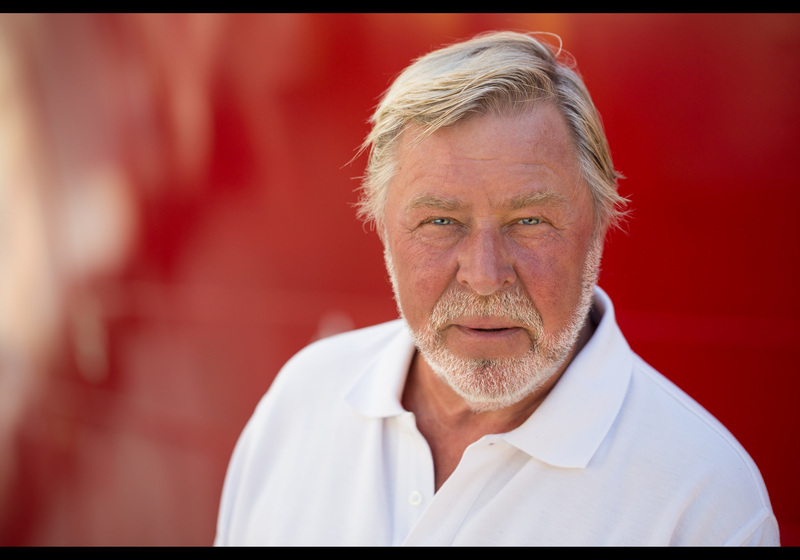 He noted too the Tall Ships Race 2014, the event that had brought him back to his native Bergen from Croatia where he owns a yacht and sailing business. Definitely something I will return to Bergen for next year, inshallah. Technically it’s another two reflector set up – Einar holding one sunfire, with the gold one camera left in the hands of the “hooded accomplice”. The only issue perhaps is the red of the ship. If you stand under the best part of 4,000 square metres of reflective red metal on a sunny day, you end up with lots and lots of red! However, for Einar I think it enhances his ruddy complexion and sailing credentials. It also offers a nice contrast with the shot before it in the series; Lina. Thank you Einar – both for your time and for getting in touch. I’m glad you like your picture and might see you at next year’s tall ships festival. Takk! This is portrait #60 of my 100 Strangers Project – check out the group page and get involved. I’m now back from my two months and catching up with contacts. Hope everyone is well!